Norman Rockwell Thanksgiving paintings perfectly embody the flavor of our favorite fall seasonal holiday. Without further ado, here they are. I have attempted to present them in chronological order of the holiday feast. Celebrate Thanksgiving... no matter where you find yourself. Saying Grace is one of the most moving Norman Rockwell paintings. Saying Grace reminds us to stay true to our beliefs, tradtions and faith, no matter what circumstances we find ourselves in. The grandmother and little boy are returning thanks for what their bodies are about to receive. Meanwhile, their whole immediate world watches, almost in awe. This is the all time favorite Rockwell painting among Saturday Evening Post readers, nudging 1954's Breaking Home Ties for first place. This illustration was produced and published for the 1951 Thanksgiving edition of the Post. 1951 was the last year that a Norman Rockwell Thanksgiving painting appeared on the cover of the Saturday Evening Post. Cooking is finished, now it's time for eating! My, what a delicious-looking turkey! And with all the fixings, too! Rockwell certainly captured the essence of the Thanksgiving turkey with this painting. Not only did he paint the bird just right, but he also painted the wonderful aromas wafting around the bird as it is carried to the table. We can only imagine the expectant faces of this lady's family. They have been enjoying the cooking aromas all morning. Now their mouths are watering. It is almost time to carve the Thanksgiving turkey. Not only is the turkey perfectly roasted, but it is accompanied on the platter by a selection of fall vegetables. A full turkey dinner with all the fixings is ust a couple of carving slices away. No doubt, the lady realizes how much her family enjoys the annual feast. No doubt, she also enjoys her family's appreciation. This was the first of two Norman Rockwell Thanksgiving illustrations to appear on the cover of The Literary Digest. 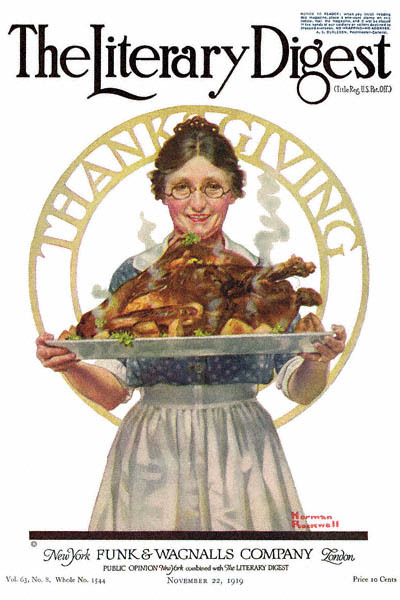 Rockwell originally intended this painting to be a Thanksgiving painting. Even though Freedom From Want was first published in March 1943. A November publishing would have made more impact as a Thanksgiving painting. There were, of course, bigger concerns, however. The Four Freedoms paintings were meant to be enjoyed, studied and taken in as a set. The paintings were, after all, created to be a pictorial embodiment of Franklin Rooosevelt's Four Freedoms Speech. Holding Freedom From Want until November would have been counter-productive. Still, even though it was published at the wrong time of the year, this is the all-time favorite Thanksgiving image by Rockwell. Many of the characters in the painting were fellow Vermont citizens whe lived in his small town. Rockwell often used his neighbors as models. That must have been some thrill: to look at that canvas and see yourself as Rockwell saw you. The feast is over. What to do now? "I am so stuffed! Couldn't eat another thing! Is that pumpkin pie over there? Well, maybe just a small slice. No, a little bigger." The above is always the after-dinner conversation at our holiday table, Thanksgiving or Christmas. These young folks have the right idea. A little diversion might take their minds off of how stuffed they are. A better diversion might have been something that is not associated with food. The boy might be better served by letting his sister win the wishbone. Then he can get back to eating that slice of pumpkin pie. This was the second of two Norman Rockwell Thanksgiving illustrations to appear on the cover of The Country Gentleman. Going back to the Pilgrim theme, Rockwell represents one of the consequences of overeating: public ridicule. This man is being punished for over-indulging in the Thanksgiving feast. Apparently there is a fine line, and he crossed it. Once again, we can only guess at the amount he consumed. Perhaps his village is running dangerously low on supplies. Perhaps he has been warned about his overconsumption in the past. Or perhaps Ye Glutton just ate the last morsel of something that one of the village leaders wanted for himself. We can play around with all sorts of explanations. 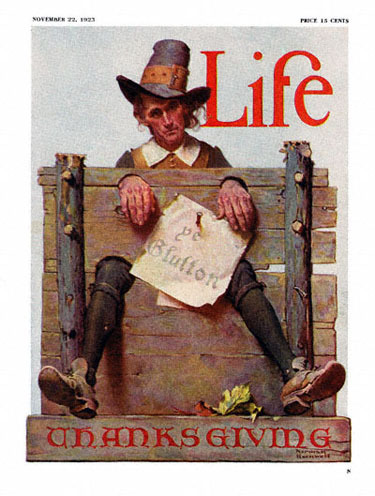 This was the second of two Norman Rockwell Thanksgiving illustrations to appear on the cover of Life magazine. After all the work on Thanksgiving dinner is done, it is time for a well deserved break. This Army chef has just served 137 men. 137 hungry working men. The menu included just about anything you can think of. All the traditional dishes and then some. So, It is definitely time for a break. Have some coffee. Maybe a cigarette, if that is one of your vices. Maybe two cigarettes. Take off your shoes and stretch your toes. Sit down and just relax. Take deep breaths. Thanksgiving will not be back for at least a year. But... wait... oh my God... next month... Christmas dinner... oh no! Wait. Deep breaths. Deep breaths. Maybe it will not be 137 mouths. It can always be harder.